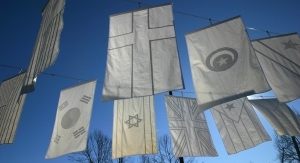 Posted by Jill S. Schneiderman in 'Eaarth' Day, Buddhist concepts, climate change, contemplative practice, earth community, environmental justice, LGBT concerns, Vassar College. Sometimes I feel blasé about Earth Day because I grow tired of talk without action. As a bujugeoscientist (that’s a Buddhist, Jewish, geoscientist) I’m inclined towards Right Speech and Right Action among the steps of the eightfold-path. As a result, I am unmoved by the verbiage of Earth Day. Founded with good intentions by Senator Gaylord Nelson forty years ago today, it was designed as an environmental “teach-in” to inspire awareness and appreciation for the Earth’s environment. But I think it’s time for the speechifying (and partying that sometimes goes with it) to be supplanted by serious (right) action. 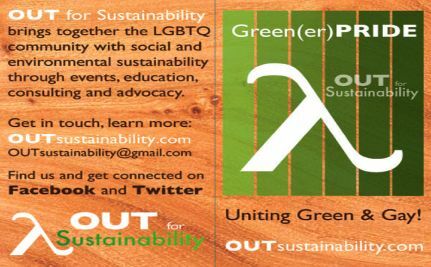 So, I’m pleased to share my delight today at having stumbled upon a new organization, OUT for Sustainability that aims to engage and mobilize the LGBT community around progressive environmental thinking. In my opinion, environmentalists like those running Earth Day events can learn plenty from LGBT activists who have had to mobilize swiftly to fight life-threatening illness and counter gross civil rights injustices. The current state of Eaarth should move Eaarthlings as the AIDS-crisis moved LGBT activists. Started in 2009, OUT for Sustainability seems to me to represent the type of alliances this planet and its living beings need now. My queer Vassar College students get this connection; for example, they are OUT working on advanced degrees in epidemiology and environmental science; serving as educators about climate change; directing films about the effects of Hurricane Katrina; and promoting organizations that focus on issues of environmental justice, including food justice and health. Thank you students! Thank you OUT for Sustainability. On Eaarth Day 2010, this Eaarth Gay feels inspired.